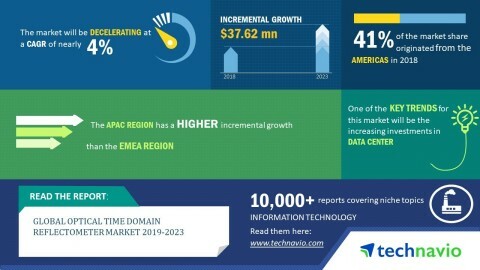 The global optical time domain reflectometer market is expected to post a CAGR of nearly 4% during the period 2019-2023, according to the latest market research report by Technavio. However, the growth momentum of the market is expected to decelerate due to a decline in the year-over-year growth. A key factor driving the growth of the growing investments in smart city project. Smart cities consist of public amenities and infrastructure connected through communication networks. Automobiles communicating with traffic lights or with the smartphones of pedestrians is an instance. Power consumption can be reduced by switching street lights on and off based on the daylight. This will need mobile networks that can handle a massive amount of data, such as 4G/5G. Around the globe, countries are focusing on the development of smart cities to manage assets and resources efficiently. As per Technavio, the increasing investments in data centers will have a positive impact on the market and contribute to its growth significantly over the forecast period. This global optical time domain reflectometer (OTDR) market 2019-2023 research report also analyzes other important trends and market drivers that will affect market growth over 2019-2023. Data centers are networked computer servers that are used by organizations for the remote distribution, processing, and storage of large volumes of data. A huge amount of data is generated owing to the development of smart cities, smart grids, and smart homes. The requirement of data centers has increased in order to monitor and process this data. "During the deployment of data centers, OTDRs are used in the testing of optical fiber cables. Multiple variations of cables such as unshielded twisted pair, coax, multi-mode or single-mode fibers, and hybrid active optical cables, are used by data centers during network establishment. These fiber cables help move vast quantities of data at a speed of 10-100 Gb/s. Single-mode optical fibers are used to facilitate Internet connections, while multi-mode fibers are used for short-length connections within a server," says an analyst at Technavio for research on communications equipment. This market research report segments the global optical time domain reflectometer market by end-users (communication, cable TV, private enterprise network, and others) and geographical regions (the Americas, APAC, and EMEA). The communication segment held the largest market share in 2018, accounting for over 68% of the market. This end-user segment is expected to dominate the global market throughout the forecast period. The Americas led the market in 2018 with a market share of over 41%. This region is expected to dominate the market through 2023, however there will be a decrease in its market share by over 1%.